Charles Bridge (Karlův most) is a 14th century stone bridge linking the two sides of Prague. This magnificent structure, one of the city's finest attractions, is the main pedestrian route connecting the Old Town with the Lesser Town and Prague Castle. From Charles Bridge visitors can enjoy fairy-tale views of Prague. The wide expanse of the Vltava River flows beneath it, flanked on both sides by elegant buildings. And Prague Castle towers above in its eminent position. Here you are truly in the centre of the city. 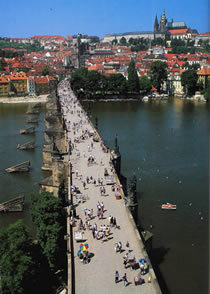 The entrance to Charles Bridge is marked at both ends by towers: the Old Town Bridge Tower and the Lesser Town Bridge Tower.